Pontiac Bonneville cabin air filter location. From year 2000, 2001, 2002, 2003, 2004, 2005. When you need to replace Pontiac Bonneville cabin air filter here you can find where is locate Pontiac Bonneville cabin air filter. Where is located cabin air filter on a Pontiac Bonneville . Cabin air filter on Pontiac Bonneville is located outside of the car on the passenger side. First time, if you what to replace by yourself Pontiac Bonneville you need to open the hood and to look on the passenger side. Look bottom picture to see where cabin air filter is located. Remove old Pontiac Bonneville filter an replace with new cabin air filter. For more guidance feel free to ask about how to replace the air conditioning filter for Pontiac Bonneville . If you want to reset service light reminder on Pontiac Bonneville click here. 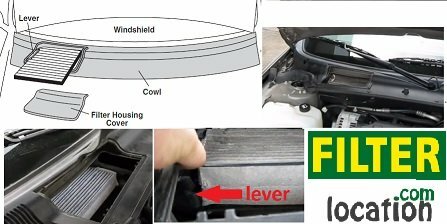 How to locate if you need to change cabin air filter, oil filter, fuel filter, pollen filter, dust filter or air filter on Pontiac Bonneville . Is there a cabin air filter on an 89 bonneville? If so where is it? 89 Pontiac Bonneville don’t have cabin air filter. Pontiac Bonneville was equipped with cabin air filter from year 2000.